We offer a broad range of options with the different types of plastics with which we support our clients and in support of our converting services. Whether you are searching for FDA grade for use in contact with food, polycarbonate plastics for a great chemically resistant work surface, PTFE to meet a military or other type of specification, or a unique application with critical specifications, call us for technical support. Call Gardico, Inc. for the finest types of materials, superior services and innovative solutions for clients across all industrial sectors. One of the most interesting uses of PTFE (Teflon®) came about during the Manhattan project in World War II when DuPont’s Teflon® was reserved for purposes of creating nuclear weaponry. PTFE is one among many plastics we offer, available as glass-filled, mechanical or virgin resin. It is also available in an expanded form for tape and gasket applications. 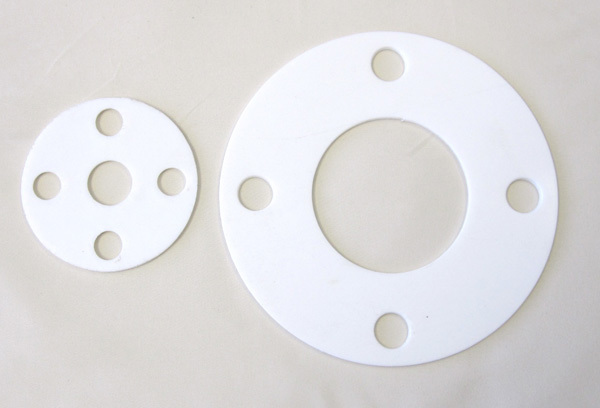 The PTFE gasket material in an expanded form can be cut into any required shapes for applications needing chemical resistance and temperatures to 500 degrees. Copyright © 2019 Gardico | All Rights Reserved.